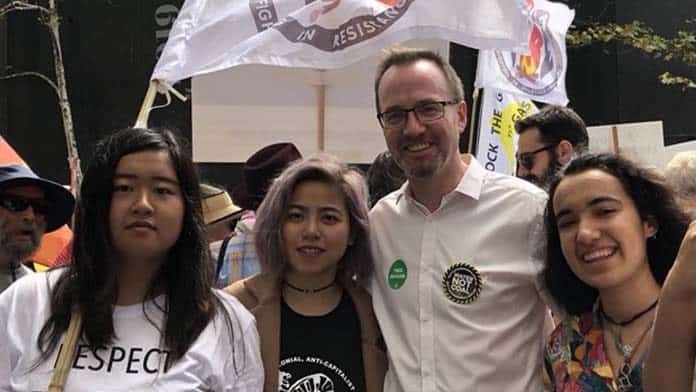 Left-Wing Greens MP David Shoebridge has decisively defeated the right-wing challenger, Jeremy Buckingham, in the latest Greens NSW pre-selection battle, securing top spot on the party’s upper house ticket for the next NSW state election. The win is a welcome reprieve for the left of the NSW party, who have suffered a series of pre-selection defeats over the past two years. Shoebridge is well known for his consistent support of social movements, particularly around Aboriginal rights. He ran a left-wing campaign, releasing a “Greens Manifesto” championing radical social democratic reforms, explicitly recognising the rise of Jeremy Corbyn in the British Labour Party. Jeremy Buckingham is a key ally of Federal leader Richard Di Natale, who has taken the party in a more centrist direction. Buckingham has been contemptuous of the democratic structures of the NSW Greens and has been willing to openly defy progressive NSW party policy to push his own agenda. If Buckingham had won this pre-selection, it would have been the end of the line for the left of the Greens in NSW. But Shoebridge won resoundingly, with 1161 votes to Buckingham’s 780. After preferences, Dawn Walker, a sitting MP aligned with Buckingham, came behind the more progressive Abigail Boyd. Affirmative action policies mean that at least one of the top two spots on the ticket must be held by a woman, and a declining Greens vote makes it unlikely the third placed candidate will be elected. However, the left cannot afford to be complacent. The result has stopped a complete rout of the left, but the pre-selection results also show the continuing strength of the right. Unless the left gets organised, Shoebridge’s pre-selection reprieve will be short-lived. It is only a matter of time before the right renews its offensive. The other pre-selection held at the same time for the “casual vacancy” created by current NSW MP Mehreen Faruqi’s entry into the Senate was won by Cate Faermann with 1181 primary votes. Faermann has spent the last few years as the chief of staff to Di Natale, helping to orchestrate the party’s shift to the “sensible centre”. Disgracefully, she even used the NSW Supreme Court to overturn a party decision that she had been ineligible to run in this pre-selection. The fact that equal numbers of people could vote for Shoebridge and Faermann (including many of the same voters), shows the extent to which the significance of the Greens’ shift to the right is not well understood by the membership. The left has work to build that understanding. The situation is urgent. Di Natale’s national march to the centre is choking the possibility of The Greens growing as a serious left alternative to Labor. The party has stalled in the polls. Thousands of teachers and public education activists were deeply disillusion by the Gonski 2.0 debacle, where Di Natale flirted with Liberal proposals to deliver a windfall to private schools. An appeal to Liberal voting self-funded retirees during the Batman election by-election compounded a view amongst many workers that the party can’t be trusted to fight for their interests. The prospect of another “Democrats moment” is almost inevitable. The future of the current Turnbull government will be largely determined by the ACTU’s Change the Rules campaign, which has already mobilised hundreds of thousands of workers. The future of The Greens too, hinges on whether the party can meaningfully relate to this campaign and position itself as a consistent and serious part of the fight against anti-union laws. Shoebridge often said that meaningful social change is driven by grassroots movements and he sees the importance of orienting to the working class and trade unions in particular, to build the power needed to challenge the system. Realising this potential will require a real fight inside The Greens to orient on class politics and building struggle outside of parliament, and away from electioneering. The right of the Greens is quite willing to use the media and its control of electoral offices to attack the left. It already has a faction. Besides the Left Renewal grouping, there have been no attempts to organise a left-wing faction within the party, for fear of hurting Greens members’ sensibilities. That delay has held back the fight needed to transform the party into a strong left activist force. If the left is going to go forward, it should take the opportunity of Shoebridge’s victory to openly declare such an organisation within The Greens. The Greens were at their strongest when the centre of their policy platform was the environment. Now that the shift in policy direction is to social policies the electorate is confused about what the Greens actually stand for. Arguing your case using the old class war terms just makes you look lost fot new ideas. Particularly when the inequalities within society have never been so great. Yes we need a strong & healthy union movement.